Since the ‘Expendables 2’ is coming out next month I thought it would be fun to do ‘the best of’ for the three biggest action stars, done Schwarzenegger a while ago and will link that below, a couple of weeks ago I did Willis’s best films and now I am doing Stallone’s best films and worst because I am not a huge fan of his. Just to point out that Stallone is a terrible actor and this list is so small that I am even including two of his films that I don’t like because it’s relevant to another release (Dredd). I haven’t actually watched a great deal of his films but apparently everything that isn’t part one of the series below is awful (well three other films that are apparently good but I haven’t seen them), cant verify that but I don’t particular like his work so I won’t be paying to see his worst (worst list not going to happen just this post). Rocky Balboa (Sylvester Stallone), a Philadelphia boxer, is but one step removed from total bum-hood. A once-promising pugilist, Rocky is now taking nickel-and-dime bouts and running strongarm errands for local loan sharks to survive. Even his supportive trainer, Mickey (Burgess Meredith), has given up on Rocky. All this changes thanks to Muhammad Ali-like super-boxer Apollo Creed (Carl Weathers). With the Bicentennial celebration coming up, Creed must find a “Cinderella” opponent for the big July 4th bout — some unknown whom Creed can “glorify” for a few minutes before knocking him cold. Rocky Balboa was not the only Cinderella involved here: writer/director Sylvester Stallone, himself a virtual unknown, managed to sell his Rocky script (one of 35 that he’d written over the years) on the proviso that he be given the starring role. Since the film was to be made on a shoestring and marketed on a low-level basis, the risk factor to United Artists was small. 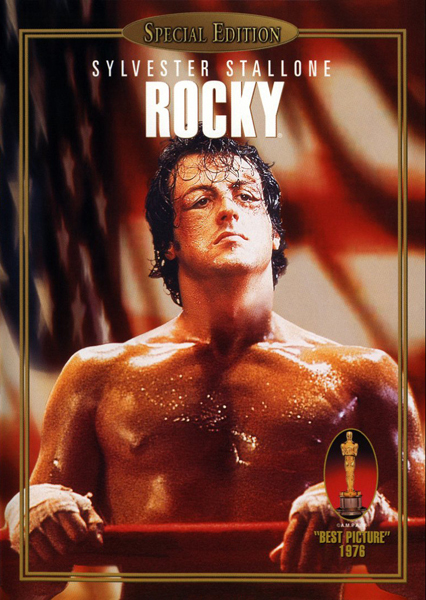 For Stallone, this was a make-or-break opportunity — just like Rocky’s million-to-one shot with Apollo Creed. Costing under a million dollars, Rocky managed to register with audiences everywhere, earning back 60 times its cost. The film won several Academy Awards, including Best Picture. Tim’s Film Reviews Recommended. The original underdog story, the first half always seemed like a depressing look on a failed boxer but then the second half was all about him hoping and trying for a this one in a million chance of being the greatest. The film also boasts great acting and drama which isn’t exactly expected of Stallone but it’s one of my favourite performances by him. 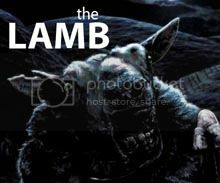 The music is great as well and that certainly continued throughout the film series. My favourite scene would have to be about half way through when he begins that argument with his trainer, which was a great scene and very powerful dialogue. Then there is obviously the actual fight which is really top notch stuff. Despite his status as a major action star, Sylvester Stallone has made a number of attempts to remodel himself as a comic actor; one of his more infamous efforts in this direction was Stop! or My Mom Will Shoot!. 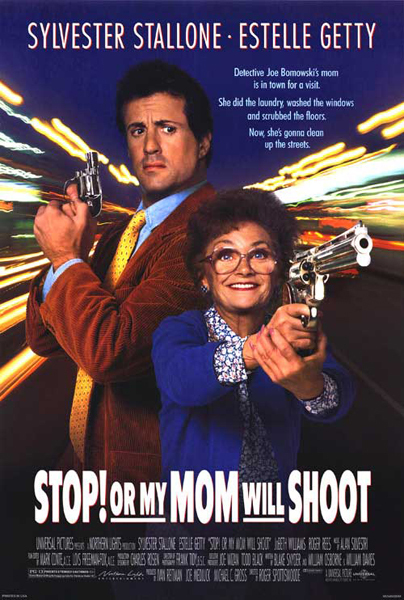 Police detective Joe Bromowski (Sylvester Stallone) has just broken off his relationship with his girlfriend (and fellow police officer) Gwen Harper (JoBeth Williams), so Joe’s mother Tutti (Estelle Getty) decides it’s time to pay him a visit. Tutti proceeds to make Joe’s life miserable by nagging him about his clothes, cleaning his apartment, washing his gun, tagging along on investigations, and somehow getting involved with a gun-running organization that the police have been trying to infiltrate. After this film, Stallone would stay away from comedy until 1997, when he played a cameo in another unenthusiastically received film, An Alan Smithee Film — Burn, Hollywood, Burn. Tim’s Film Reviews Recommended. To be honest I am not sure what category to put this, as a film it’s just awful in every way but when I watched it I had it in my mind as a parody rather than a genuine comedy film. Either way after watching it the only thing that comes to mind is “defuq did I just see!” seriously super weird. The worst of films normally have the funniest Reviews so let’s have a look. Best reviews “It is moronic beyond comprehension, an exercise in desperation during which even Sylvester Stallone, a repository of self-confidence, seems to be disheartened.” Roger Ebert. Wow, would you like a plaster for that burn?! Here’s another “Being shot might be preferable to sitting through this.” Ken Hanke. Harsh but true. I am always more into Arnie than Stallone. Stallone’s character is never strong enough to remember. I like the first Rocky, too much impossibility in Rambo. I think my fav would be Daylight, the story has more emotion. Same here, have you seen my best of Arnold Schwarzenegger? Wrong, DAYLIGHT is way more terrible. LOL. Just the fact that the “Stop or my Mom Will Shoot” trailer is online somewhere makes me laugh, Tim. 😀 Nice share.